I had read Epstein’s Let There Be Sculpture in South Africa, along with many other books, when I came to Imperial College of Science and Technology in 1956. I vaguely recalled some passages: a penetrating judgment on Rodin (Rodin had no sense of architecture); a strong view on patina (in favour); a rant against dealers (they prefer their artists dead); a complaint that a major work had been purchased only by a freak show. But like most people at the time I was not interested in Epstein sculptures either; I much preferred Rodin and (seduced by all those pretty madonnas) my first love, Italian art. In my blinkered Ph.D. ignorance I did not even know that Epstein dwelt less than 500 yards from where I was proudly slaving over my little thesis, and that the sculptor was completing a statue to the deceased prime minister of my own country. But even among those more aware of what was going on around them, few could have predicted that the old man still had it him to create two of his greatest works for London. Within three years both were in place, but only gradually did I begin to register their presence. They permeated into my consciousness as threads in the tissue of experience, which a great city weaves in the minds of those who live in her. 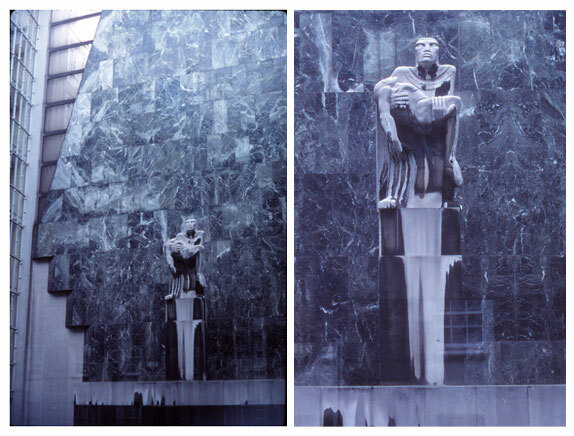 In 1956, the aged sculptor took up his tools to begin carving a huge block of stone, which had been set up before a volcanic backdrop of veined Italian marble in the forecourt of TUC House (figure 1). By that time Epstein had grown, in the words of Kenneth Clark, from “a master of style” to “a master of truth”. This monument to the dead of two world wars is really a first artistic vision of the magnitude of the powers unleashed by science and technology – and thus a fitting archaeological treasure to be excavated from the rubble of London in some remote future after World War 3. Everybody knows Einstein’s horrified prediction that, if WW3 is fought with nuclear weapons then WW4 will be fought with bows and arrows. Much less well known is the reaction of Edwin Muir to this prediction of wars being fought with bows and arrows: thank goodness, then we shall get back to The Horses (– a poem which T.S. Eliot described as the first poem of the Atomic Age). Epstein’s vision is less Arcadian (or Orcadian) than Muir’s, and more cosmic. His volcanic marble backdrop dwarfs even his huge stone figures, it spears upward like a rocket launching into outer space (figure 1). The figures are not human – (at least not Homo Sapiens sapiens) and yet their gesture is the essence of what we humans call “human” – what the Bantu call “ubuntu”: fellowship and sympathy. Men must endure their going hence even as their coming hither. / Ripeness is all. E ‘n la sua volontade è nostra pace. With this in mind, I think the bereaved creature’s face reflects a psyche nearer to the Judeo-Christian faith of Epstein and Dante than to Shakespeare’s stoic humanism. Though He slay me, yet shall I trust in Him. This is a vision of survival on an astronomic scale; and it sits there in prosaic commercial London, in the Trade Union office block, not a hundred yards from the YWCA where I used to take my English children for their swimming lessons. The Renaissance archaeologists who dug up Classical Antiquities for the booming Italian art market were well aware that no Greek sculpture is complete without something missing; so a marble Bacchus by young and promising Michelangelo had a protruding front bit drilled out, to give it an air of greater antiquity. On this ground alone, one might say that some works of Epstein became classical antiquities during the sculptor’s lifetime (see the essay on Epstein’s sculptures for the British Medical Association). 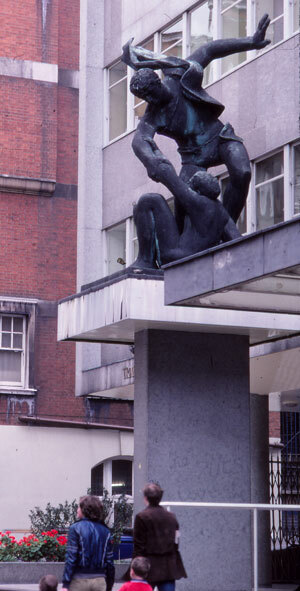 The memorial figures have not been mutilated, but when I visited London in the 80s, Epstein’s carefully planned backdrop of volcanically veined marble (figures 1 and 2) had already been replaced by monotonous ceramic tiles in a ghastly glassy green, the colour of cheap boiled sweets (figure 3). 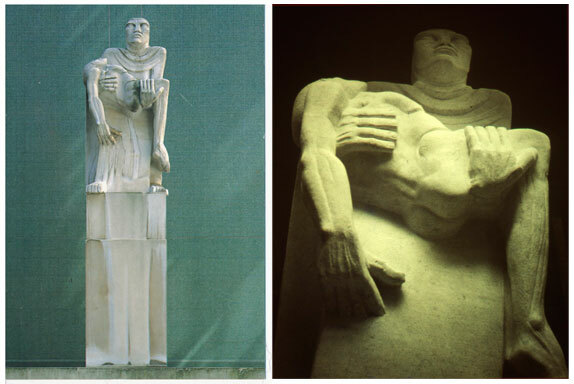 The stone figures had been scoured back to deathly white, and the patina that reveals their form to the eye of time (figures 1 and 2) had been wiped clean (figure 3): reset to time zero. Anyone who has read Let There Be Sculpture will know what a sin that would have been in Epstein’s eyes. The vandals seemed untroubled by guilt, as witness this proud postcard (figure 3). Resignedly I inquired the motive of the misdeed, and was told that the vandalism was official: it had been committed in the interests of Health & Safety (see also BMA essay). “Who will protect me from my friends?” No doubt the figures are more hygienic after a good scrubbing; and as for their architectural background in the atrium of TUC house, it is safer (and cheaper) to stick up blue-green swimming pool tiles than to attempt anything so tiresome as mundane maintenance on the sculptor’s massive slabs of polished marble. (I wonder if any craft union member lodged a protest against such skimping of the work.) Here is a note from the papers of the late David McAll RA, who assisted Epstein on the monument: “It was carved from a 10 ton block of Roman stone and was originally backed by green Carrara marble running up to the roof; this decayed and has been replaced by green tiles as an economy measure”. I hope that my amateur photographs (or preferably better ones) might survive to the 4th or 5th millennium for future archaeologists to reconstruct the architectural setting as the sculptor intended it, and as Londoners of my generation saw it – the way archaeologists of today know from traces of paint that Greek sculpture and its architectural setting were intended to be enhanced with colour, not remain coldly neo-classical white. I was unable to photograph from near because a glass wall separates the atrium, but figure 4 is a finely expressive closeup of the statue by Geoffrey Ireland (sans patina because photographed when new). It was scanned from the catalogue of the 1980 Epstein centenary exhibition, of which more later (see part six of these essays on Epstein’s busts). TUC headquarters are fortunate in having a good piece of sculpture outside as well as in (figure 5); both sculptures are on the theme of solidarity, comradeship and goodwill: a reminder from bygone times, before the Left fell into the arms of Mrs (“there is no such thing as society”) Thatcher and begat Thatcher’s Children – “intensely relaxed about becoming filthy rich”. Woe to the country whose rulers ape the profiteer!